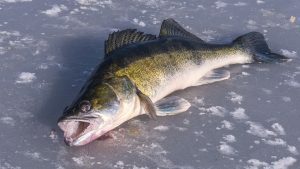 Saginaw Bay Area recent weather has made ice here iffy and there was some open water. This coming weekend cold front should make plenty of ice. Saginaw River had a slow fishing period due to ice flows and the launches icing in. Some anglers on the river were catching walleye anywhere from 13 to 24 inches. Sebewaing fishing activity was slow with only a few pike and perch caught, plus some small bluegill. Tittabawassee River saw a slow fishing period due to ice flows and the launches icing in. Tawas Area anglers were starting to ice fish, but no success was reported yet. Walleye have been found in the bay. Have you been attempting to target panfish during your ice fishing trips this winter, but aren’t having much luck? Consider the following things. Are the panfish sticking to shallow or deep depths? Are they hanging out in the weeds or on the rocks? Are they suspended or are they hugging the bottom? Due to the weather much of the state has experienced recently, panfish are likely to be in deeper water to find more oxygen. Keep that in mind when you look for them! Also keep your presentation efforts in mind. A popular effort includes putting a jig on the bottom and using a twitch-pause-twitch routine with it. For more information on winter fishing in Michigan, visit Michigan.gov/fishing.